Shopping in Greece and Italy was so much fun on my Mediterranean cruise! The shops had so many great souvenirs — and at reasonable prices, too. Italy is famous for leather goods, and I couldn’t resist getting a black leather tote bag — something I’ve always wanted. (Had to drag it around with me all day touring Venice, but it was worth it.) The leather smells so good and the bag feels so soft. 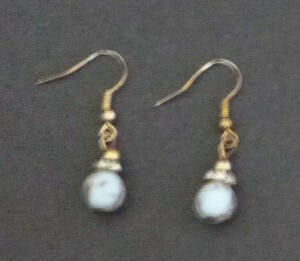 The selection of Greek earrings was great, too. Could’ve gone crazy buying them — but settled on a couple different pairs, plus one pair made from hand-blown Murano glass. 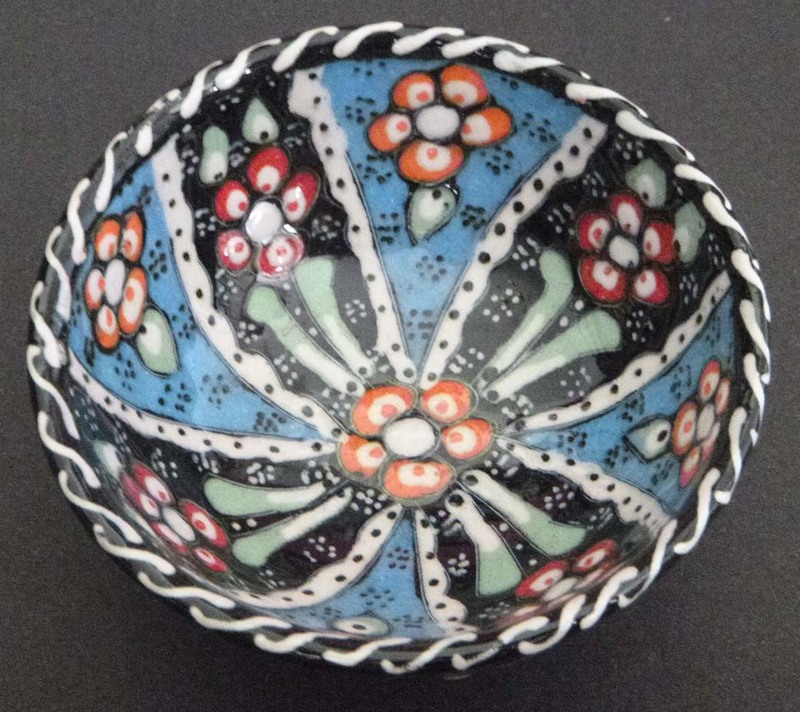 There were a lot of pretty hand-painted dishes in Greece, so I got a small one for jewelry. Since warding off the “evil eye” was big in Greece, had to buy several things with the bright blue “evil eye” marker on it — including several bracelets. 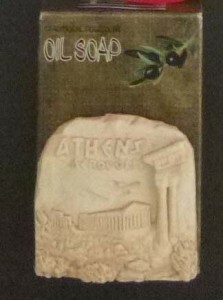 Olive oil soap was popular, and the bars made great gifts. Most of them had some sort of magnet or other item affixed to the outside of a prettily wrapped package, so it was like getting two items for one. Had to get a Christmas tree ornament to commemorate the trip — and the blue-domed Greece church was just the thing. Got a big canvas tote bag and several kitchen items, too. Loved the bright blue colors on everything. If you take a trip to Italy or Greece, you’ll have a lot of gift items to choose from! 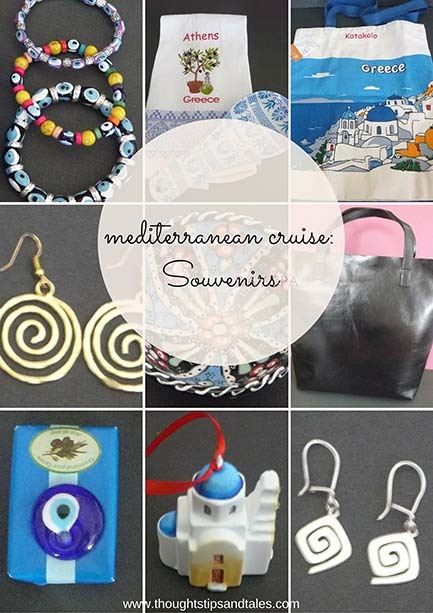 This entry was posted in mediterranean cruise and tagged Mediterranean cruise, souvenirs. Bookmark the permalink. Looks like you got some cute stuff for sure. 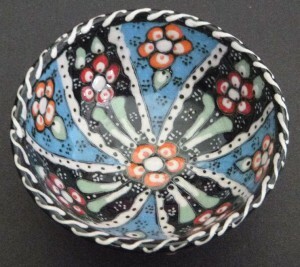 Love the bowl! Carolann recently posted…Caramelized Onion Biscuits Recipe! September Is National Biscuit Month! So many nice things that you’ll have for a long time to remind you of your trip!